Ahem – this is one for special occasions as it is quite calorific, but I think it is so good it’s worth it. And you only need a small slice – good practice for your willpower! Spelt flour does work better than regular wholemeal here so do get hold of some if you can. Supermarkets sell it. Preheat the oven to 180°C/Fan 160°C/Gas 4. Line 2 x 20cm sandwich tins with non-stick baking paper. Beat the butter with the lime zest until very soft and well aerated – you can do this in a stand mixer or with a hand-held electric beater. Put the flour in a separate bowl and mix in a pinch of salt and the baking powder. Add an egg to the butter along with a tablespoon of the flour mixture. Fold them in, then repeat until you have used up all 3 eggs. Fold in the remaining flour, followed by the maple syrup and the lime juice. The mixture should have a dropping consistency. Divide the batter evenly between the 2 tins. Bake the cakes in the oven for about 20 minutes, until they are lightly golden brown, well risen, and shrinking away from the sides of the tins. Remove them from the oven and put them on a cooling rack. When the cakes are completely cool, take them out of the tins and peel off the baking paper. Whisk together the crème fraiche, double cream, cream cheese, lime zest and juice and maple syrup. Set aside a third of this mixture for the top of the cake. 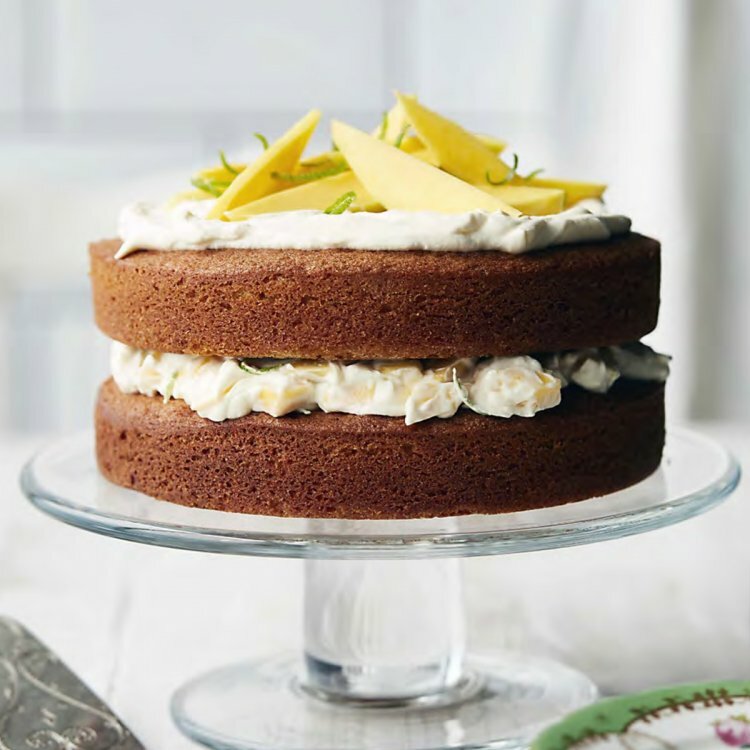 Mix the diced mango into the larger amount of cream mixture and spread it over the top of one of the cakes. Place the other cake on top. Pile the remaining cream mixture on top of the cake, forming a round in the centre, then arrange the mango slices on top. Garnish with a few strips of pared lime zest.